As we’re entering 2017, we wanted to share with you a recap of what we did last year and share some thoughts on what we’ll be working on this year. We passed 3,000,000 users on the Scoop.it platform. Overall the content they published received more than 185 millions views, another proof if needed that great content drives traffic. Scoop.it turned 5 in November. We’re grateful for your continuous support as we couldn’t possibly have achieved these great milestones without you. On behalf of the whole team, thank you! 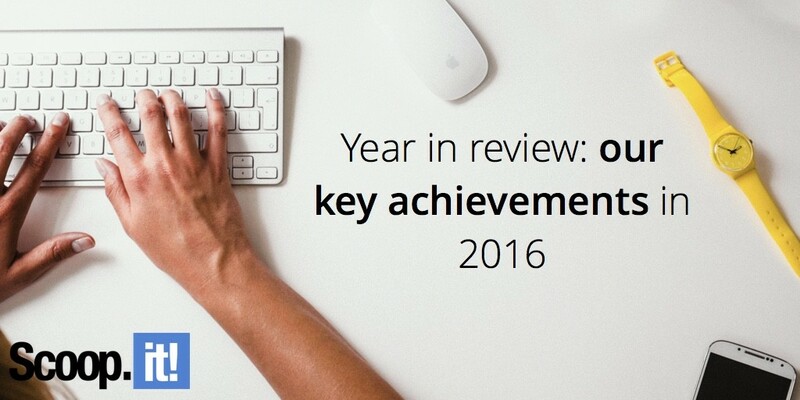 So let’s review the main new product features we launched in 2016. Product-wise, our main event last year was the result of our R&D work on AI (Artificial Intelligence) and that led to the launch of the V2 of Scoop.it Content Director. 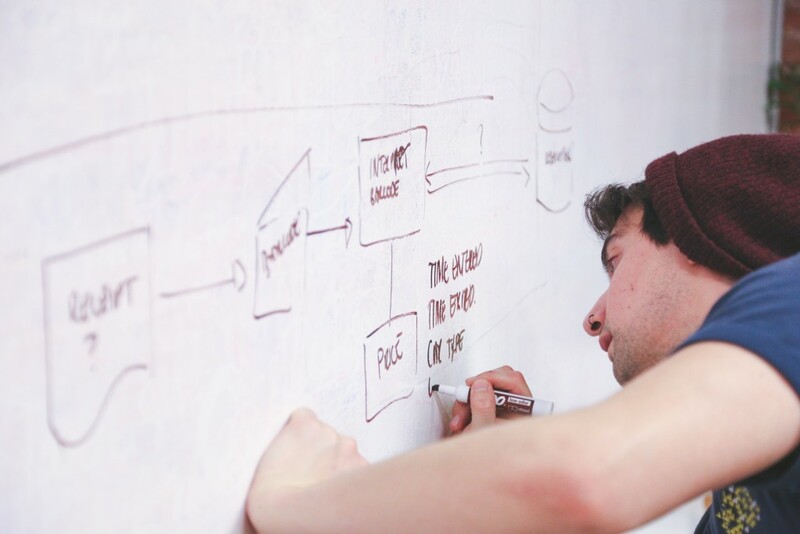 Building our suggestion engine and getting so many users on the platform provided us with a huge amount of data. Adding AI technology to make sense of this data seemed like a natural steps as many marketers struggle themselves with understanding what works and what doesn’t with their content. Scoop.it Content Director first version focused on saving time to marketers by combining our curation technology with an automated workflow of the content marketing lifecycle. Leveraging AI, our V2 brought content marketing intelligence as a way to help marketers not just work faster but also smarter. This feature gives you predictive insights on your content performance so you can generate more results without doing more work and understand better what content to create next. Detailed content analytics for each post to precisely measure the ROI of your content and what results your various distribution and promotion actions drove. New CSV analytics export to give you flexibility to generate custom reports for your team or your agency clients. 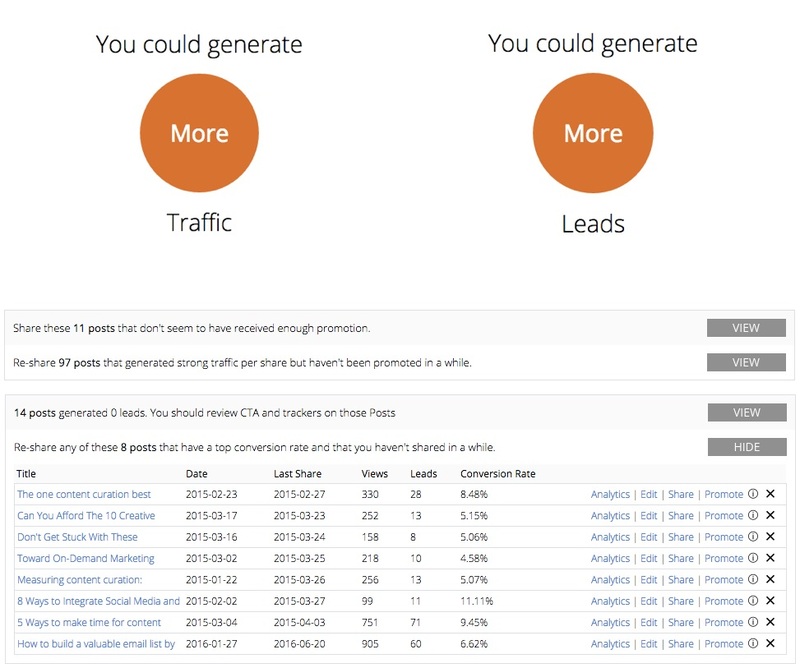 Lead tracking integration with Marketo, HubSpot, Mailchimp so you can understand exactly how many leads each piece of content generated, a lead being defined the way you define it in your marketing automation or email list system. Our integration with Google Drive lets you create blog posts directly from Google Documents that have been authored or edited by your team. This system builds on a platform many of you use to collaborate on content creation, review and edit blog posts while enabling you to keep track of deadlines and publishing targets using Scoop.it Content Director’s Smart Calendar. Even better, this feature automatically formats your Google Document as a blog post in your WordPress site so you don’t have to waste time copy / pasting images or adding broken hypertext links. This V3 of our email newsletter editor builds on the drag-and-drop UX that we introduced in the previous version but also brings a lot more flexibility by letting you add various widgets for text, images or HTML in your newsletter template. The result is lightning fast, fully branded and completely customizable email newsletters creation. Whether for curated or original content, visuals play a key role in grabbing readers’ attention. But they can also consume a good part of your content publishing process. With the image library feature we introduced last year, Scoop.it Content Director synchronizes all the images from your blog so you can recycle the ones you want for each and every post you schedule or publish. By repurposing your previous investment, you save time getting content published with impacting and brand-compliant images. Building on the integrations we built from the start with major social networks, we took content distribution to the next level last year. Follow integrations with Facebook, LinkedIn, Twitter, Google+, Tumblr, etc… we were glad to add Pinterest to the list of destinations we support – something many of you asked us for and that became possible through the release of Pinterest third-party API. This new integration enables you to distribute both your original (in Scoop.it Content Director) and curated content (in Scoop.it Content Director and Scoop.it free and premium plans). The time when you could share your content once and expect to get 10-15% engagement is simply gone. The lifetime of a tweet is less than 25 minutes and you’re luck when you have more than 5% reach on a Facebook page. This content overload means that sharing is not enough. For each piece of content you create, you need to have a comprehensive promotion plan consisting in sharing it multiple times over multiple channels – a best practice most content marketing influencers recommend and that was instrumental in Jeff Bullas’ success in building an audience from scratch. To make that possible, we introduced Promote. Determine the channels you want to distibute your content too, select the number of times you want your content shared on each of these channels and… voilà! Scoop.it Content Director takes care of the rest and programs these multiple shares over time in order to reach the most of your audience while avoiding follower fatigue. Another great way to generate impact for your content is to involve your community in co-creation. As Andy Crestodina puts it, “an ally in creation is an ally in promotion”. With the evolution of our integration with Twitter, you can now easily mention a Twitter account or add a hashtag as you promote your content on Twitter. Mention influencers you quote, contributors to your content or members of your community you want to get the attention of. Get your content seen by like-minded people by using targeted hashtags. In the same spirit of building on the impact of visuals to generate more engagement, you can now directly embed videos in your tweets when you share from the Scoop.it platform (available with all versions). Embedding Scoop.it topic pages is the easiest way to add curated content to your website. With this improved embed format, you can now star a post in your Scoop.it page to have it featured at the top of your embedded stream of curated content. Ever since we launched, we’ve had people reach out to use Scoop.it as a way to share curated news internally and privately within teams or organizations – something we answered by launching Scoop.it Knowledge Sharing, an enterprise-grade solution to disseminate market intelligence, third-party information and even internal documents efficiently. Last year, we kept adding to this platform by introducing the following features. By integrating with Okta, we made it easier to support your corporate single-sign on system (SSO) as a way to onboard any team member you’d like. Instead of having each of them create their own Scoop.it account one by one, you can leverage this integration to provision as many accounts as you want in your team or organization. And also control which usage rights they have access to. Another alternative to simplify the onboarding to Scoop.it Knowledge Sharing for companies that run on Google Mail is to have coworkers use their Google account to signup or login. No password to remember, team members can signup or login in one click – a feature that encourages adoption across your company. The main channel through which Scoop.it Knowledge Sharing customers disseminate the content they’ve curated for their teams is via private internal email newsletters. Leveraging our email editor that automates newsletter creation makes it a 5-10 minute process. Last year, we added analytics to this module so you can measure the impact your internal newsletters have on your organization. The above list summarizes the main features but there’s a lot more that we did, including a new iPhone App, Tag autocomplete, plus numerous revisions to our suggestion engine, our automation algorithms and our predictive insight engine. Most importantly, we’re not going to rest on our laurels and have much more in the pipe for 2017. In this coming year, we’ll continue to focus our R&D work on leveraging artificial intelligence for content marketing. Being one of the most used content curation platforms in the world give us access to unique data on what we call “the relevant web” – the millions of posts that are meaningful enough to be curated and shared by our user base of professional experts. This puts us in a unique position to develop the best algorithms to help you guide your content marketing efforts. Of course, we also want to keep improving the experience for all of our products. In 2017 as before, there’ll be improvements to design, features to simplify and new use cases to address. To do this, we’ll do what we’ve always done: collect your feedback. So let us know: what should we focus on building in our products this coming year? And if you want to work smarter and start generating real results from your content marketing? Find out how to use the new Scoop.it Content Director to help you become a smarter marketer!